Happy, happy Friday! Fridays are a favorite day of mine having been born on a Friday and since it marks the end of the work week and the beginning of the weekend. Who doesn't love their days off work though? I adore being able to sleep in (or at least linger in bed for a while), stay in my pajamas (Isn't "pajamas" an intriguing word? Where did it originate? I like the sound of it) longer than I should, watching morning cooking shows, reading a book if I like, blog-jumping...just having the freedom to use my time how I decide. What are your favorite bits of the weekend or the days you have off? Anyway, I thought I would continue on with the Kenner Road stamp theme (by the way, make sure to check out Kenner Road's gallery and blog as the design team is excellent). I love this sweet polka dot bird. I decided to paper piece the wing. In all I was pleased with how this card turned out. I don't think the luscious metallic green color comes across very well in the picture. I have been painting cardstock for ages now. When on a budget (or even not) there is nothing better than being able to easily and inexpensively alter that plain white cardstock we all have easily. I have found that the metallic craft acrylic paints have the best feel on paper...they feel smooth and the paper is still very flexible while other craft acrylic paints can make the paper feel almost chalky and brittle. Perhaps a coat of gesso before the craft acrylic paint would alleviate this issue. I also believe that higher quality acrylic paints like Golden would make the paper feel more like the metallic variety than the craft acrylic paint. The other stamps I used were from Unity Stamp Company. I have many of their Kits of the Month which are great deals and full of really cute stamps. The frame stamp is fantastic and comes from the November 2008 Kit of the Month. 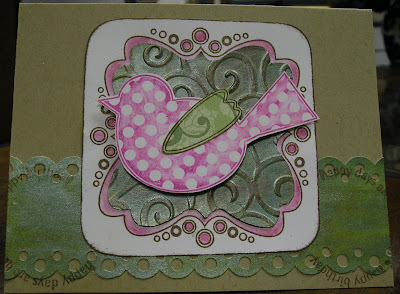 Patterned Paper: Spring Silhouettes Designer Series Paper, Stampin' Up!